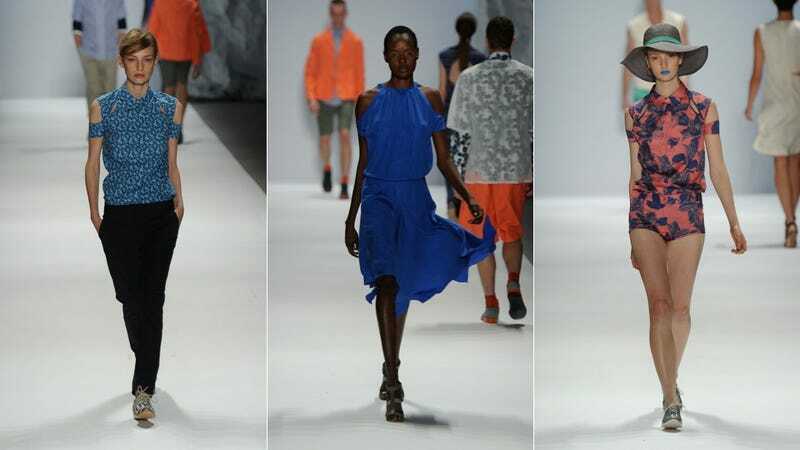 Yesterday morning's Richard Chai show was a bright highlight of fashion week so far. There were stripes, and floral prints, and the coolest flats. Nothing fussy, just cute summer clothes in oranges, royal blues, and mint greens. The pants were so well-fitting. The cropped trousers and the blouses made me think of people wearing novelty shirts in the 1950s. In a really good way. So I didn't totally love the, ahem, floral bike shorts — but those shoes? The cap-toe oxfords? They had really brightly colored outsoles. Like, black shoe, bright blue outsole, or silver shoe, green outsole. And there are no good photos of them on Getty, so you're going to have to take my word for this. But they looked great, and like you could walk comfortably in them for a while.